The BBC News Channel celebrated its 20th anniversary today, and we got to see a few glimpses of Corb who, as you may know, presented the first weather forecast on what was then BBC News 24. Thanks to TV Newsroom for the video. Thanks to MP's Newswatch for the video. Finally some quiet weather. It's almost like somebody has given Mother Nature some chill out pills. 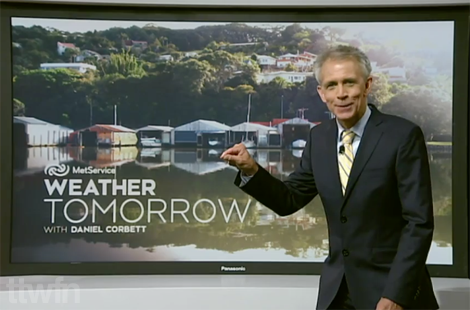 “So throughout the night we’ll be updating you as the cyclone tracks down the country,” he explained, pointing at a large map of New Zealand. “This is the country, right here. This is what it looks like. And we’ll be able to show you the different kinds of weather it’s bringing to different locations based on what’s happening to our wonderful men and women on the ground. “For example, here’s Chris Chang. He’s in Tauranga. He’s very, very wet, and he’s begging for a change of clothes. We’re not going to give him any, of course, so there’s a lot of rain there, as you can see. 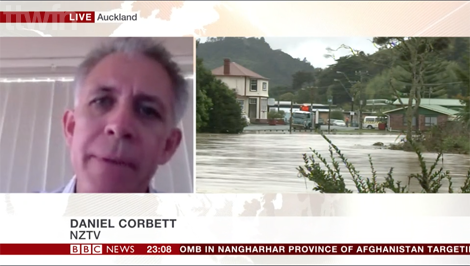 Will Hine, who is reporting from Whitianga, has had a request to briefly come inside because he was “cold to his bones” declined by Corbett, who said it would damage the integrity of the experiment. Yay! 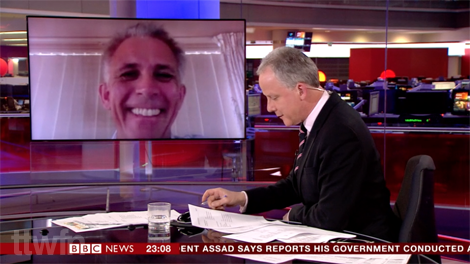 Dan was (briefly) back on the Beeb! 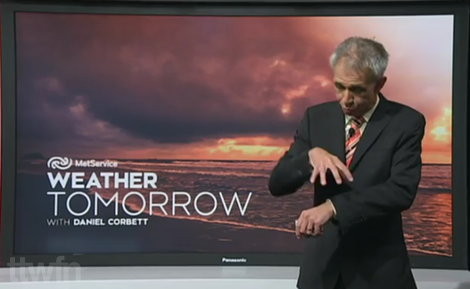 This time to talk about Cyclone Cook. I always call it a big, mean, ugly windbag. It's pretty much like Mother Nature saying, 'I'm gonna make a cake,' and she takes all the ingredients mixed together, put some nasty, put some horrible, put some mean, mix it three times and then, boom. You already leave some salt on a wound, this is like taking a bag and going, pfff, like that. Mother Nature, being autumn, has a busy dance card. Quite happy to kick this thing out the back door, lock it, put tape round the edges. The tail end of Cyclone Debbie is set to hit NZ - but where will it strike? Very heavy rain. It's like Mother Nature taking, not a garden hose, a fire hose [gestures doing so] and, ffff [spraying gesture], like that. Pretty nasty spell of weather coming our way... You'd almost think that Mother Nature has, pttt, spit the dummy - and in a big way. Boom. Like a boss, indeed. We drag the moisture from the tropics and we need a mechanism to bring it down, like a big bucket scooper. The big high is sitting in place ... think of it like a big bull sitting in a paddock; it finally gets up, it's gonna start moving away. The weather's not changing too much. It's a bit like hitting the replay button on the CD, you keep playing the same song [pressing button gesture]. Weathercocks is a UK-based weather podcast offering an irreverent yet informative look at all things weather. In Episode 11 they named their top 10 weather presenters and Dan was fairly high up on the list and named 'most enthusiastic'. It came as a surprise that one of the hosts had never heard of several of the people in the top 10. Never heard of Carol Kirkwood? Really?! Anyway, it's worth a listen, even if just for that section, from around 23 minutes in: Weathercocks Episode 11. By Episode 12 the rankings have been re-evaluated and Corb has a more suitable position in the charts (from just before 44m in). As @Nasalhair put it, That's the weather, for meow.